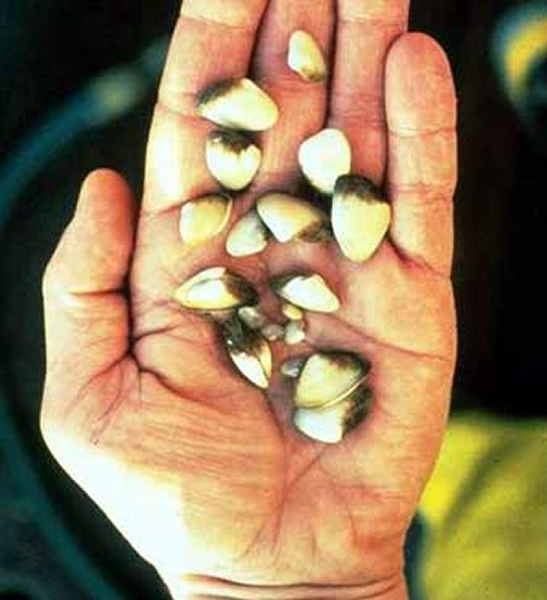 The invasive Asian clam, Corbula amurensis, is one of the invertebrate species the scientists studied. U.S. Geological Survey (USGS) scientists have been studying the effects of silver on reproduction in marine life in the San Francisco Bay. Traditional biological-assessment methods conducted in a laboratory indicate little adverse effects from silver, especially on fish, at environmentally relevant concentrations. Field studies, however, show significant reproductive damage associated with exposure to silver. Thus, the field studies raise a cautionary flag regarding the use of traditional laboratory-based assessments for decision making. The City of Palo Alto, California, has used results from the USGS study to indicate the value of its improved wastewater treatment and source-reduction programs. The City has received national awards for its source-reduction program, part of which involves the use of USGS data. Bouse, R.M., Wellise, C. and Thompson, J. 1999. Bioaccumulation of metals by the bivalve Macoma balthica at a site in South San Francisco Bay between 1977 and 1997--Long-term trends and associated biological effects with changing pollutant loadings. U.S. Geological Survey Open-File Report 99-55. 42 p.
Lee, B.-G., Griscom, S.B., Lee, J.-S., Choi, H.J., Koh, C.-H., Luoma, S.N., and Fischer, N.S., 2000, Influences of dietary uptake and reactive sulfides on metal bioavailability from aquatic sediments: Science, v. 287, no. 5451, p. 282-284. Lee, B.-G., Lee, J.-S., Luoma, S.N., Choi, H.J., and Koh, C.-H., 2000, Influence of acid volatile sulfides and metal concentrations on metal bioavailability to marine invertebrates in contaminated sediments: Environmental Science and Technology, v. 34, no. 21, p. 4517-4523. Lee, J.-S., Lee, B.-G., Luoma, S.N., Choi, H.J., Koh, C.-H., and Brown, C.L., 2000, Influence of acid volatile sulfides and metal concentrations on metal partitioning in contaminated sediments: Environmental Science and Technology, v. 34, no. 21, p. 4511-4516.